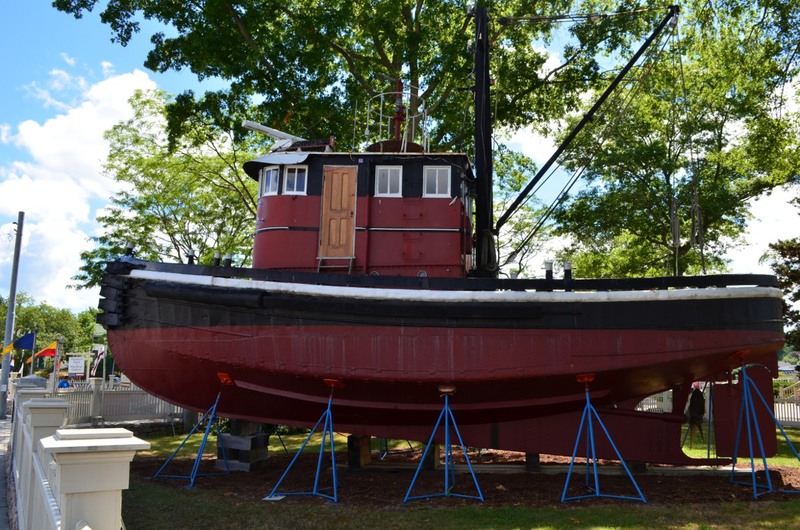 Mystic Seaport’s beloved tugboat Kingston II was among the earliest all-welded vessels. Built to train apprentice welders before they qualified to work on U.S. Navy submarines, she was made of scrap steel in just four months. Today, she is stationed at the main entrance as a proud ambassador of the Museum’s watercraft collection and a symbol of this region’s important maritime contributions. 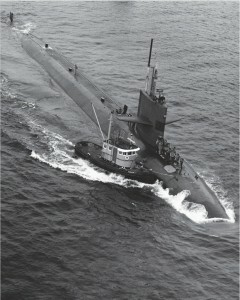 Kingston II maneuvering a U.S. Navy submarine in the 1970s. Courtesy Electric Boat. For 42 years Kingston II worked the docks at Groton’s Electric Boat (EB) plant. She attended the launch of many U.S. Navy submarines, including the world’s first nuclear submarine, Nautilus, and guided subs into and out of repair docks. The tug also shuttled equipment to other EB locations, helped with the construction of the Thames River’s Gold Star Memorial Bridge, kept the docks clear of ice, and responded to fires on the Thames and Mystic rivers. Kingston II carried a crew of three: a captain and two deckhands. Basic work hours were 7 a.m. to 3 p.m. but the tug and crew responded to calls at any time of the day. During busy stretches they might work more than 100 hours in one week. Kingston II had only two captains during her long EB career,Thomas Majewski and Thomas Payton. The Museum’s whaleship Charles W. Morgan receives assistance from Kingston II on a snowy day in 1980. Photo by Mary R. Maynard. After Cold War-era nuclear submarines grew too large for Kingston II to handle, she was declared surplus and donated to Mystic Seaport by the General Dynamics Corporation. She arrived at the Museum in 1980. Even before joining the Mystic Seaport fleet, she had helped move the Museum’s historic ships in the 1950s and 1960s. After her arrival, she spent 20 years shifting vessels to and from the Museum’s restoration shipyard, ice-breaking, restoring bulkheads, delivering derrick barges, and standing ready in case of fire. Her ceremonial duties have included leading river parades of antique boats and welcoming visiting vessels from other nations.